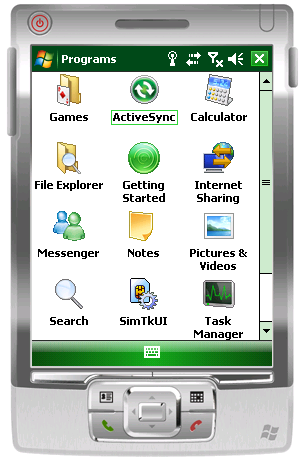 Windows Mobile comes with a pre-installed ActiveSync client. This software can be used to synchronize E-Mail, contacts, tasks and appointments between the mobile device and the Open-Xchange Server. Please note that this guide refers to an unmodified version of Windows Mobile 6 Professional. 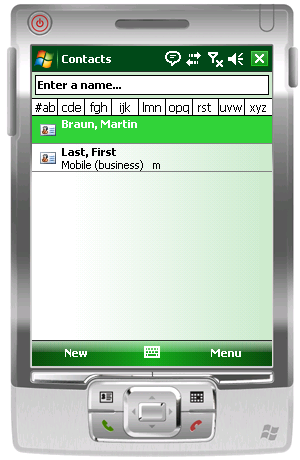 Many mobile operators customize the user interface of the device and add or remove applications. 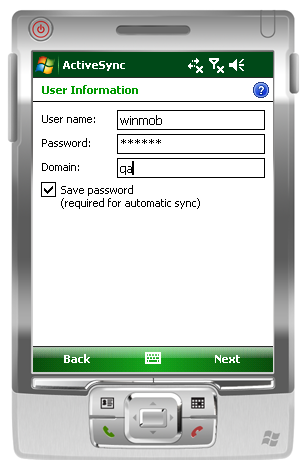 If you cannot find an application or setting described at this guide, please refer to the device manual or your mobile operator for assistance in setting up ActiveSync. 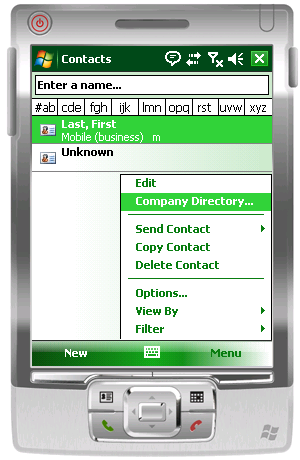 Locate the ActiveSync client at the 'Programs' folder of the Windows Mobile main menu. Start it by taping the screen or select it with the device controls. This application is used to synchronize your data, depending on the synchronization mode the synchronization needs to be triggered here. 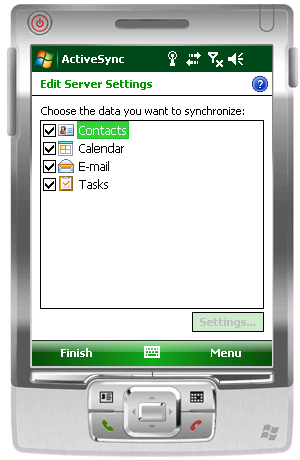 The ActiveSync clients welcome screen shows various ways to synchronize the device. 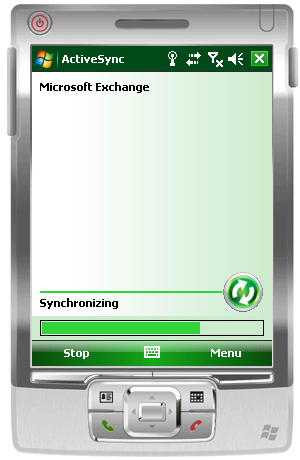 Tap or select 'set up your device to sync with it' to set up an connection to the Open-Xchange Server. 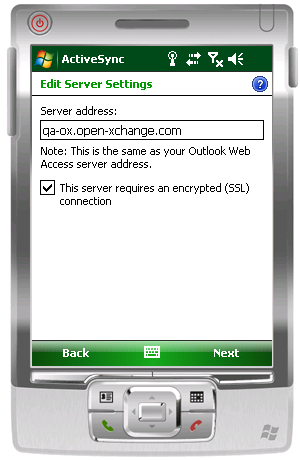 Enter the E-Mail address of your primary mail account at the Open-Xchange Server. Disable to option 'Attempt to detect Exchange Server Settings automatically'. Now enter the network address of the Open-Xchange Server, in this case is ox.domain.com, replace domain.com with the domain name you subscribe. If your domain name not yet fully propagate, you can use 103.6.196.172 (MY) , 103.7.8.151 (SG), 173.248.178.95 (US). If the server supports HTTPS (encrypted data transfer) enable this checkbox. Enter your Open-Xchange account credentials. If your account name contains an '@', enter the first part to the 'User name' field and enter the second part to the 'Domain' field. For example: the account 'mike@ox.io' becomes user: mike, domain: ox.io. If your Open-Xchange Server account does not contain an '@', enter the user name and enter 'defaultcontext' as domain. Also enter your Open-Xchange password, these credentials will be used to authenticate against the Open-Xchange Server and to access your data for synchronization. Select the modules you want to synchronize with the device, typically all modules should be selected. After the configuration is complete, the device will start an initial synchronization process. Depending on the amount of data stored at you Open-Xchange account and the network connectivity of the device, this can take a while. 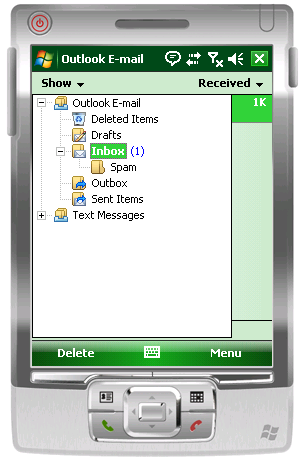 To read and compose E-Mail on your mobile device, just switch to 'Messaging' at the Windows Mobile main menu and select 'Outlook E-Mail'. Your Open-Xchange E-Mail account has already been synchronized to the mail application. Select 'Send/Receive' from the Outlook menu to trigger E-Mail synchronization. To select a different folder of you Open-Xchange E-Mail account, just tap or select the folder list at the upper left of the Outlook client. The Open-Xchange calendar data has been synchronized to the devices calendar application. 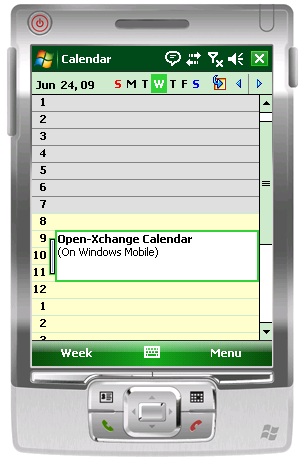 Just select 'Calendar' from the Windows Mobile main menu to access or modify your schedule. 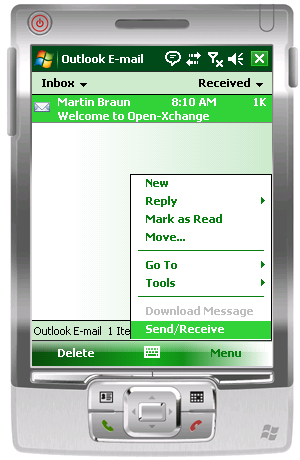 Your Open-Xchange contacts can be found at the Windows Mobile 'Contacts' applications. To search the global address book of you Open-Xchange acocunt, select 'Company Directory' from the context menu. This application will perform a live lookup to the global address book to get the most recent contact data about your colleagues. Task lists have also been synchronized, simply access the Windows Mobile 'Tasks' application from the main menu or the 'Programs' folder.